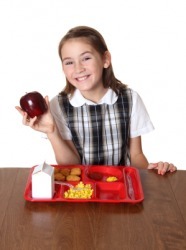 A girl eats her school lunch. The definition of lunch is a meal eaten at midday. An example of lunch is a sandwich at noon after meeting a friend. To lunch is defined as to eat a midday meal. An example of lunch is to go out to get a nice meal with friends at 1pm. "lunch." YourDictionary, n.d. Web. 25 April 2019. <https://www.yourdictionary.com/LUNCH>. A meal eaten at midday. The food provided for a midday meal. To eat a midday meal. Can you hold lunch for a little bit? It was past lunch time so the three of us dropped by The Main Street Café for a late lunch. Lunch is in the refrigerator. Are you going to have lunch too?